On Tuesday 6th February the children at St. George’s participated in ‘Number Day’, an nationwide fundraising event in aid of the NSPCC. Every child was encouraged to come to school dressed as a number of some description. Fun mathematical activities were held in every classroom throughout the day. From musical numbers, to cooking, monopoly madness, four rolls, measuring mania each class had lots of fun using their number skills. 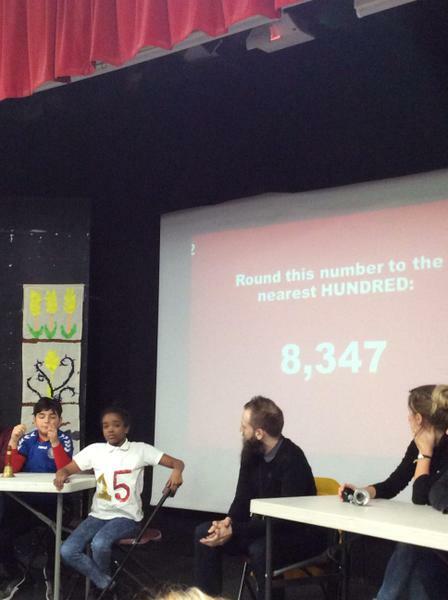 A group of children from KS2 battled it out with the teachers in a ‘Mega Maths Quiz’. Their speed and efficiency at calculating mentally meant they won out on the day. Altogether, the school raised £148. 57. Thank you everyone for your support.